The sixth Ariane 5 launch of the year took place on Tuesday, December 4 at 5:37 pm (local time) from the Guiana Space Center (CSG), Europe’s Spaceport in French Guiana (South America). 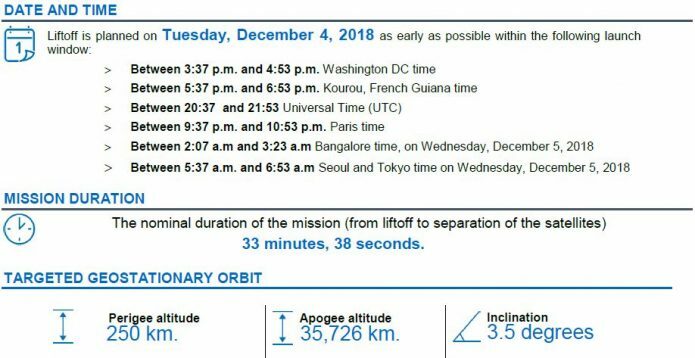 This 10th mission in 2018 reflects the availability and flexibility of Arianespace, which has performed a launch every two weeks since November 6. GSAT-11, configured on the new-generation I6-K satellite bus, will provide communications services with multi-spot beam coverage of the Indian mainland and nearby islands. With this new satellite, ISRO will help bridge the digital divide in India within the scope of a program that capitalizes on space technology to support national development, while also pursuing space science research and planetary exploration. GEO-KOMPSAT-2 is a national program developed by KARI for the South Korean government, involving the development and operation of two civilian geostationary satellites, GEO-KOMPSAT-2A and 2B. Flight VA246 is the 10th launch performed by Arianespace in 2018: six using Ariane 5s, two with Vega and two with Soyuz. In the fourth quarter of the year, Arianespace has once again proven its flexibility and reliability by carrying out five launches in two-and-a-half months (September 25 – December 4), with launches coming every two weeks since early November. The last launch of the year will continue this momentum, as Arianespace will use a Soyuz rocket to launch the CSO-1 spacecraft for the French defense procurement agency DGA (Direction générale de l’armement) and the French space agency CNES. Shortly after the orbital injection of the GSAT-11 and GEO-KOMPSAT-2A satellites, Stéphane Israël, Chief Executive Officer of Arianespace, said: “With this 10th launch of the year, Arianespace is glad to support two major space agencies: ISRO of India and KARI of South Korea. We are very honored by the renewed confidence of ISRO. GSAT-11 is the heaviest communications satellite ever built by the agency, and the first to be carried in the upper position on Ariane 5. We are also very proud to launch the GEO-KOMPSAT-2A weather satellite, in our second mission for the Korean space agency KARI. My congratulations to these agencies for the construction of these advanced satellites, which will help reduce the digital divide in India and improve Korean weather forecasts. Today’s launch marks the latest mission for a better life on Earth, and we are both pleased and proud to have performed it in the presence of the Chairman of ISRO, Dr. K Sivan; of the Vice President of KARI, Mr. Sang Ryool Lee. This launch also took place in the presence of Mr. François Garay, Mayor of Les Mureaux and President of the Community of Ariane Cities in 2018, whom we thank for his constant support.